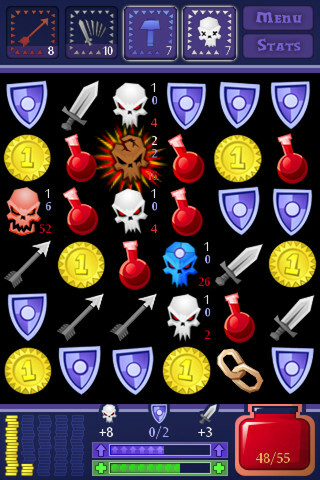 Dungeon Raid is a very addictive puzzle game for iPhone. You start of as a Human Adventurer, with a randomly-selected, one-screen backstory. Just enough to get your imagination rolling and not enough to be cumbersome. As you play you'll be able to unlock and level up more classes, races, and abilities. To explore, slide your finger across the screen to link together identical items; rather logically, coins will yield money for upgrade, potions regenerate your health and shields improve your defence. If you want to destroy the skull-like enemies, link them with sword to deal damage. This very simple gameplay is rich with many strategies, especially if you go after all the achievements available through the Openfeint system. In addition, you have three game modes and 4 difficulties lengthen even more its replayability. I very warmly recommend this game, especially as a free demo is available and as the completegame will cost you all of three dollars; definitely not bad for a game worth several hours of fun.